This is a result of me needing an afternoon snack and a desire to use the abundance of kale I had in my fridge. Sometimes these spur of the moment grab and combine snacks result in less than appetizing combos but this one was excellent so I thought I would share it. Kale isn't everyone's cup of tea, but I really like it. It is really good for you and it doesn't have a strong flavor so you can put it in smoothies and soups to add nutrients. It also has a thicker texture than salad so it feels like a more substantial snack than a regular salad. Remove the leafy part of the kale from the thick stem, rinse and place in a glass bowl. 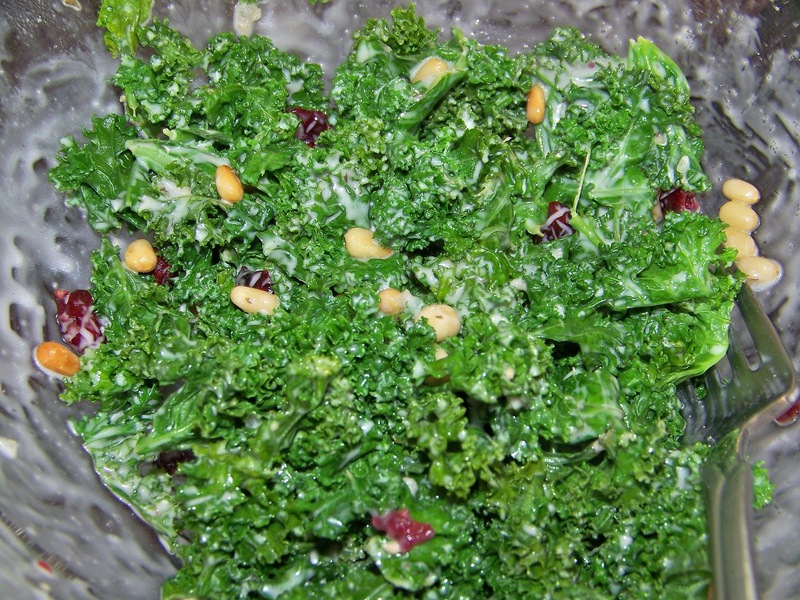 Squeeze half a lemon on the kale and toss to coat. Microwave the kale fore 30 seconds. In a small bowl, microwave the pine nuts for one minute (or you can toast them in the oven or on the stove top). 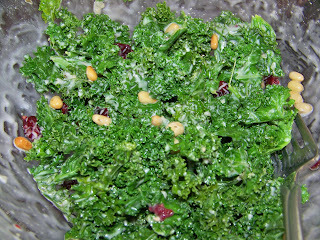 Sprinkle the kale with the pine nuts and cranberries. Drizzle Caesar dressing on top and toss to coat. Enjoy!